Wellington Art Society members with staff at the hospital. 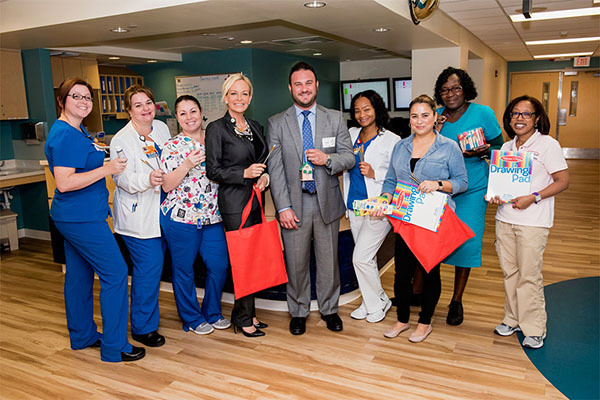 Sharing the love of art with the community is a large part of the Wellington Art Society’s mission, and a new project to bring art to the pediatric unit at Palms West Hospital is a dream come true for Wellington Art Society President Carolina King, as well as many other members. The project got underway on April 4, which was just the beginning of bringing watercolor paint, supplies and crafts to children recovering at the hospital. When an attorney at the law firm where King works heard of the project, he reached out and offered to sponsor the first visit. King said she is looking forward to partnering with others in the community who also want to spread the joy of art to the children. For more information about the Wellington Art Society, visit www.wellingtonartsociety.org. If you would like to sponsor a monthly art visit, or donate art supplies, e-mail presidentofwas@gmail.com.